The women in my Bible Study have embarked on a journey to study the Proverbs 31 woman. Now, why should single women study the "virtuous wife"? Its interesting, she's the woman of the Bible feminists thumb their noses at the most, but when you look at her, the Proverbs 31 woman is the woman who "Has it all". She has a career outside the home (sewing clothing and sashes that she sells to merchants). She makes investments (considers a vineyard) and makes a profit from it. She has a husband who adores her and who is respected among his peers. She has children who praise her. She successfully runs a household. Isn't that what the feminism movement has been trying to sell us since the 1960s? Well, feminists have argued that the Proverbs 31 woman is an image created by man to make us women feel inadequate, unworthy, inferior. Boy is that far from the truth. We (the women in my Bible study) were trying to decide upon a few different studies. We had a lot out on the table. We lifted the choice up in prayer to God and took a week off. That week off also included a woman's conference at church with the theme, "Turn Down the Noise. Hear the Voice of God". The speaker was Lysa TerKeurst, she is a wife, mother, author, President of Proverbs 31 Ministries and co-host of Proverb's 31 Ministries national radio program. Now, none of us knew this when we went to the conference. But as we attended the main lectures and the smaller break-out sessions, all of us began to wonder if God was leading us toward studying the Proverbs 31 woman. 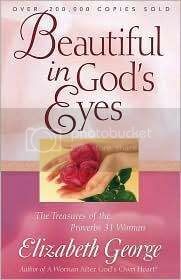 Well, we all decided to do a study using a book by Elizabeth George, "Beautiful in God's Eyes". Interestingly, several of us (including myself) had already read this book on our own a few years ago. I remember thinking back then, this would be such a good study to do with a group of women. This book discusses each verse in each chapter. So, week one, we discussed the first half of Proverbs 31:10 (NIV). The first thing that I had never realized back in Proverbs 31:1 is that, yes, this was a saying of a King, a man, but it was an oracle his MOTHER taught him when he was a young boy. The queen is not only teaching her son the Hebrew alphabet, she's imprinting on his young mind the characteristics of a wife he should be looking for when he grows up. The other thing that was highlighted in the commentary, the Queen EXPECTS her son to be able to find a single woman like this. So its possible for us as women to have these characteristics - - because, not only does God expect us to have them, another woman expected us to have them. In addition, these characteristics are present in single women (the queen isn't going to want her son going after other men's wives, at least I don't think so). These aren't characteristics that we miraculously develop on our honeymoon - - we should have them and be working on perfecting them long before we ever marry. The other thing I had never realized, the hebrew word used for "Noble Character" is the same word used in the Old Testament to describe an army. The Hebrew word refers to a force that is able, mighty, strong, worthy - - and the commentary went on to list many others. Wow, we women are a "Force"! But you know, if you think about it, when we as women are on a mission, we are a force to be reckoned with. I mean, threaten our children or family, holy cow, you better get out of the way! Along the lines of being described in parallel to an Army, so often, we women are the prayer warriors for our family and God calls us to pray unceasingly (Ephesians 6:18). This is a great study and I'll share with you all what we discuss. If you are looking for something for your women's bible study - - or even a study on your own, I highly recommend this book. And you all are welcome to share your insights or comments along the way.